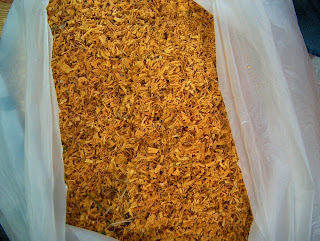 Osage Orange chips, very freshly cut as in this afternoon! The smell is out of this world the color unbelieveable~! I'm going to cover these, about five pounds worth, in everclear to extract the best yellows and they will then be soaked in water for several weeks to extract the remaining yellows. This method produces a yellowish orange color.